This hill fort in Maval located near Kamshet is only an hour away from Pune. Tikona is about 60 km away from Pune. It's a perfect getaway for when you have just enough time on the weekend to squeeze in a short trip outside the city. The view from the fort is spectacular. But the best part is that literally, anyone could trek to the fort without having to worry about their trekker-experience level. Trekking is always fun, and it's better in groups. When you take a train from Pune station to Lonavala, peer out of the window and be marvelled by the views. Once you reach Lonavala, head towards Kamshet, where locals will guide you to the Tikona Fort base from where you start the trek. Trekking can be tiring no matter what, so some snacks and water are necessary, right? There is a small place called Tikona Upaharagruh in Tikona Village which offers basic food, snacks and water. 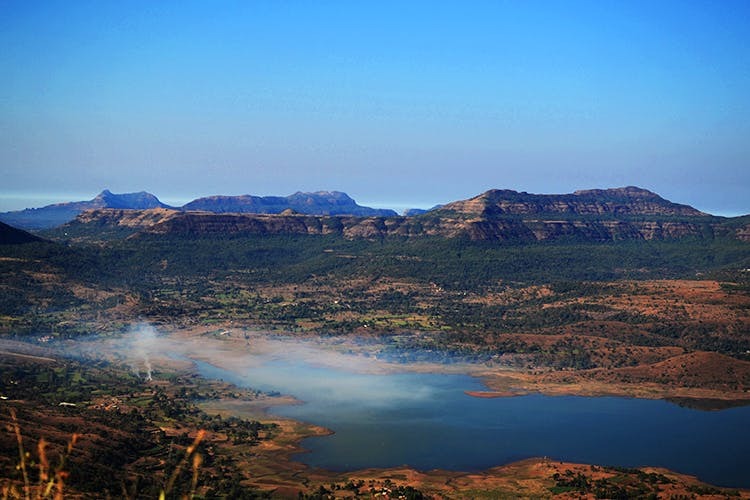 There are few clichés that you can cover in Tikona Fort Including the Trimbakeshwar Mahadev Temple, Satvahan caves and the phenomenal panoramic view of Pawna dam and the nearby forts as well. After completing the trek, you can eat at any local dhaba in Lonavala. We recommend The Kinara Village Dhaba, where you can try butter chicken, kadhai paneer and butter naans. Food always tastes better after some physical activity, no? Wear shoes for the trek as this trek tends to get slippery when there's mist and during the monsoons.